We have to required many details from users at the time of registration. For capture lots of information at the time of registration we have to make long registration form on our website. So reduce headache of long registration form we have divide that form information in smaller logical section and convert into multi step registration form. This type of multi step form will improve usability of our website as compare to long form. This multi step form we have not only use in registration but we can also in any event where we want to insert lots of data. 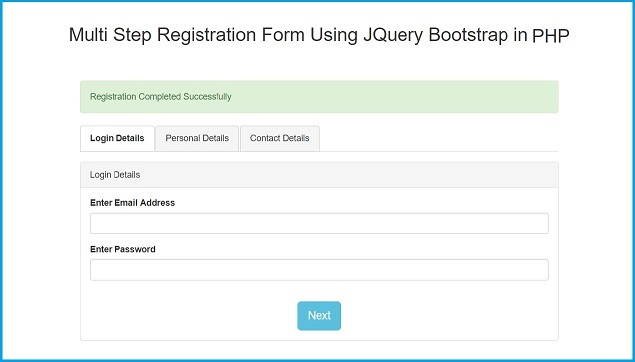 For making multi step form we have use Bootstrap library and Jquery with PHP server script. In current scenario web development multistep forms are more popular that long form due to more user user friendliness. Multi step form give us easy step by step fill to complete long procedure form. If there are in long form with too many HTML input fields for fill details then we can break that many input fields into different multiple smaller forms fields, forms filling to user to make it more convenient. And In Multi step form we can divide form validation into different step, so if previous form validation run properly then user can go to next step. So in multi step form can divide validation into different step. So in this post we have discuss how to make Multi Step Form by using Bootstrap JQuery with PHP PDO and Mysql. By using we will make multi step form which will provide useful functionality to user then input too much data into form. So, We will divide form input fields data into steps and if user has fill first step with proper validation then he can go to next step clicking on next button only and suppose user want to go previous step then he can only go previous step by clicking on previous button only. When use has complete to fill data in all step will proper form validation and he has come to final step then on final step user can submit form data to server. So, multi step form method will reduce human error while filling of data because each step data has varify on that step and if data properly filled then he can go to next step. So, here we have make multi step form by using Jquery Bootstrap with PHP PDO and Mysql. Thtanks And having good practices with these code..